A brief update on the ongoing changes at CSA Czech Airlines. After being cleared by the EU Commission after an investigation into State Aid from the Czech government in 2012 and following on from Korean Air’s decision to acquire a 44% stake CSA Czech Airlines earlier this year, management at CSA have announced two initiatives. First, the company has signed an important cooperation agreement with Etihad Airways. 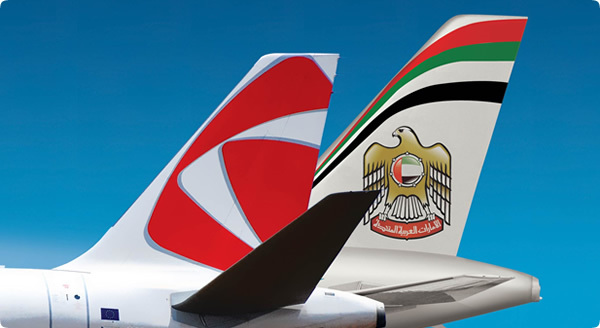 The deal makes Etihad a partner of CSA Czech Airlines FFP – OK Plus allowing members to collect and redeem miles on 80 new destinations. The airline has retrofitted an Airbus A319 that will bring customers to Etihad’s hub in Abu Dhabi. The retrofit includes a fully upgraded business class cabin including bigger seats and recline as well as new product offerings. Individual courses served during the flight have been developed by Marek Fichtner, the executive chef of Le Grill Restaurant in Kempinski Hotel Hybernska Prague. There’s also an enhanced IFE system too with every business class passenger being provided with an iPad preloaded with movies and games. This would be in line with Etihad’s superior business class product and would maintain consistency for customers code sharing with Etihad. Second, the airline has leased an A330-300 to offer non-stop service to Seoul, Korea. Flying twice a week (at weekends), the plane will allow customers based in East Asia to get to Europe and connect on to other destintions within the CSA network. “Thanks to the mutual harmonisation of departure and arrival times, passengers travelling from Prague will have perfect connections to Korean Air flights from Seoul to Japan, China and the Pacific. Prague and may become not only an important transfer point, but also a gateway to Europe on their trips beyond Prague,” said Jiří Marek, Czech Airlines’ Vice President for Sale and Marketing. While the Etihad deal makes a lot of sense and the upgrade of the business class cabin is in line with such an arrangement, the Seoul flight is baffling. Given the fact that Korean Air already operates service to Prague with their own planes, either Korean and CSA have agreed to share the route (effectively reducing Korean Air frequency) or there will be cannibalisation of their efforts. CSA also plans to use the A330 for its longer Central Asian flights too. We’ll see what happens. PreviousExtending Strategies for Low-Cost Carriers: South West Airlines and Air Asia.